The vote I cast yesterday in favour of the Prime Minister’s Withdrawal Agreement was one of the hardest of my time in Parliament. I decided, on balance, that the risk of us losing Brexit altogether was just too high to vote against. I continue to have deep misgivings about the deal. I didn’t want to vote for it. It was very hard to do so. If it had been passed, it would have meant long years fighting against the worst aspects of its implementation. But it was the least unpleasant option available. Many of my leave voting constituents have continued to write to me calling for a WTO Brexit. There is a strong possibility that tonight, Parliament will vote with a large majority against a No Deal Brexit. The Remain majority in Parliament does not reflect the will or the vote of the people. But today, will make itself heard. No deal denied, Article 50 extended. When that happens, as I’m now sure it will, the conversation will move to a second referendum. This will take years, to pass the legislation and to agree on the question. At this point, I think the chance of Brexit happening at all falls away. The fight for Brexit continues. I will vote today to keep No Deal as an option and, tomorrow, against any extension of Article 50. My commuting constituents already suffer enough. Govia Thameslink Railway (GTR) haven’t exactly covered themselves in glory since taking over the franchise from First Capital Connect. Some factors have been out of their control, others are not and they are consistently failing. As long as I’ve been an MP commuters have filled by post-bag and inbox with horror stories of the Bed-Pan line. First it suffered from under-investment under consecutive government for decades. Now money is flowing into the line again it suffers from GTR’s appalling mismanagement. As soon as the timetable changes were announced, users of Flitwick and Harlington stations asked me to pass their warnings to both GTR and the Department for Transport. I was very happy to do so. Measures taken to mitigate a reduction in the number of trains serving the stations would be all well and good if they worked. They have not. At all. Having a lack of drivers is a problem that has plagued GTR for too long. The time when they can blame this on the previous franchisee has long since passed. Cancellations because of a lack of drivers isn’t good enough. Since GTR took over the franchise I have told them that I expect clear, accurate communication with passengers when things go wrong. This is a basic requirement for my constituents to know they can get to work on time and home again before children and partners go to bed. This is perhaps the worst failing of the last two weeks because GTR can blame nobody but themselves. It’s been a shambles. I’ve been relaying the very many emails I’ve received on the subject of GTR’s failures to their senior management and the Department for Transport. I want nobody to be under any illusions just how seriously failed my constituents have been. GTR are unfit to manage the franchise and have proved themselves so by gross incompetence. When Parliament returns next week I will have a series of meetings with the Secretary of State and managers from GTR and Network Rail. I will be calling for recompense for users of Flitwick and Harlington stations, an acceptable level of service and a full, independent investigation of what has gone wrong throughout this sorry saga. Ultimately, my constituents pay thousands of pounds to travel into London for work. It is a high cost line with a worse than low-cost service. My constituents deserve compensation and I will be fighting for them to get it. Excellent news about the appointment of Dominic Raab as the new Housing Minister. This is a hugely important subject in Mid-Beds and I look forward to working with Dom, CBC and my constituents in the coming months as the new Local Plan is put forward. As one of my colleagues pointed out yesterday, it takes a special kind of magic to turn a multi-billion pound success story of much-needed investment in railway infrastructure into a ‘horlicks’ of inconvenience and miscommunication. Yet, somehow, that is where we are with our train services in Mid-Beds. As my commuting constituents will be all too aware, Network Rail, East Midlands Trains (EMT) and Thameslink recently, suddenly and with no consultation, announced a very significant shake-up of the railway timetables. As briefly as possible, to enable infrastructure upgrades north of us, and to take advantage of previous upgrades south of us, fast EMT trains will no longer stop at Bedford during peak hours. Instead, Thameslink trains will run fast to Luton, no longer stopping at Flitwick and Harlington. For my constituents who commute from Bedford this is inconvenient, efforts at mitigation then cause further inconvenience down the line for commuters using Flitwick and Harlington. As an MP I’ve rarely been as angry as I am about these changes, both because of their significance and the appalling manner they’ve been set out and communicated. There is simply no doubt that this has been handled badly and I will continue to press for an explanation of what went wrong. I will also keep up the pressure on Thameslink to stick to their promises for easing the negative effects of these changes for my constituents. All services stopping at Flitwick and Harlington in peak times will be 12 carriage trains. New trains will have both free wifi and tables. Older trains will have these retrofitted. Perhaps the most significant benefits of the investment on the Thameslink London core are less tangible but of very real advantage to my constituents. Fewer delays, fewer cancelled trains and less time spent waiting on cold, windy platforms. As with any major infrastructure development, the devil is in the detail. Thameslink must provide the benefits they are promising, most importantly longer trains with larger capacity at peak hours. Another informative and enjoyable day in the constituency on Friday. 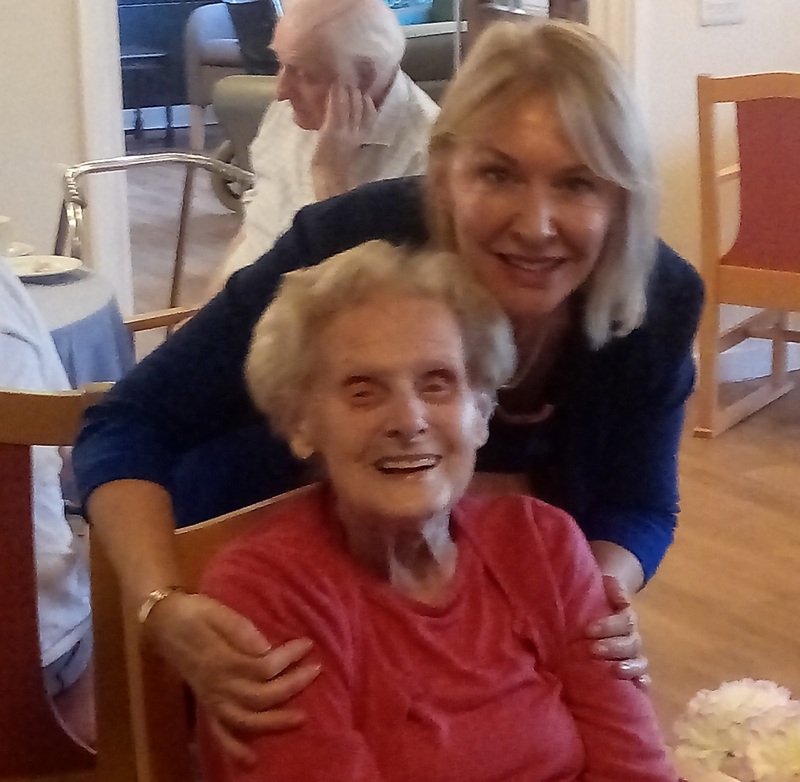 But the absolute highlight was meeting Jean, who lives at the excellent Ferndale residential home in Flitwick. Jean will soon be celebrating her 105th birthday! Her determination to enjoy life was infectious, as shown by the pictures of her taking one of the first swims in the pool at the new Flitwick leisure centre. I’d like to thank everyone at Ferndale for hosting me on Friday. The residents for letting me come into their home and the staff for working so hard to make it possible.